When considering the wildest teams in baseball history, all roads lead to Flushing, home of the 1986 New York Mets. Stuffed with rowdy youngsters along with a few reckless veterans, the club was as hard-partying a group that ever played the game, let alone won a World Series. In this tour through MLB history, we check in with the team that was known as much for trash-talking, on-field brawls, boozing, and cocaine use as blinding baseball talent. Jeff Pearlman, a Mets beat reporter for Newsday, chronicled the team’s World Series run in a book titled, The Bad Guys Won: A Season of Brawling, Boozing, Bimbo Chasing, and Championship Baseball. The title tells everything you need to know about the ’86 Mets’ off-field exploits, but the details end up surprising even the most imaginative of fans. For example, picture Darryl Strawberry dumping a bottle of champagne on Mayor Ed Koch’s head after the team arrived home from its NLCS win. Led by the Jesse Orosco-led unit known as “The Scum Bunch,” the Mets had just trashed a United DC-10 it chartered for the return trip from St. Louis. Against protocol, wives and girlfriends were on board, and at least three were covered in vomit and had to be carried off the plane upon exit. On the expense front, the booze bill and damages to the aircraft was estimated at tens of thousands of dollars. Cases of champagne were consumed, a celebratory Mets cake served as the ammunition in an epic food fight, and Strawberry broke several seats convinced they could fold into beds. Dwight “Doc” Gooden told of walking by the plane bathrooms and seeing a teammate with his face buried in a pile of cocaine, so oblivious he forgot to lock (or even close) the door. Once the Mets were able to communicate with one another in the clubhouse, Pearlman describes Davey Johnson waving a bill for the plane’s damages in front of the team. 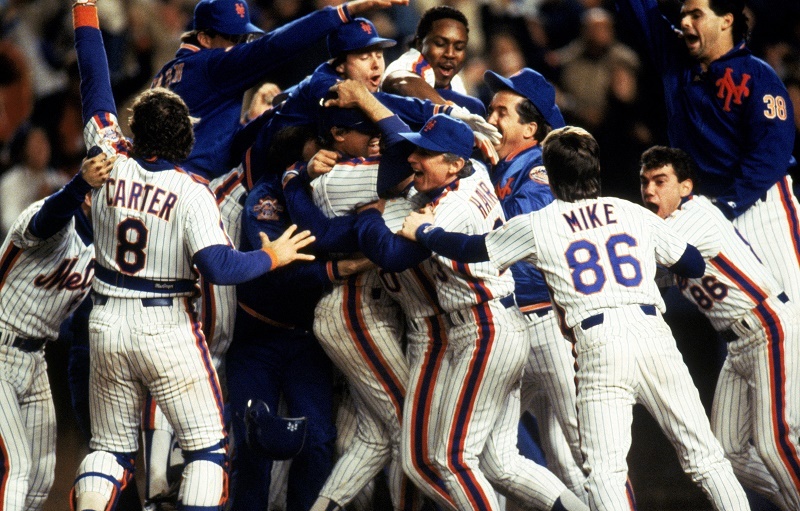 The 1986 Mets did not reserve their lewd behavior for post-game celebrations. Teams grew accustomed to trash talk coming from the Mets bench throughout the season. With Lenny Dykstra, Kevin Mitchell, and Roger McDowell in tow, such behavior had become part of the club’s approach to winning, and they were never afraid of taking taunting to its logical conclusion. The dust had barely settled on the July 11 bench-clearing spectacle between the Mets and the Braves. In that episode, Strawberry charged the mound after being plunked by Dave Palmer, who wanted every bit of the fight Straw was offering. The benches emptied on at least two other occasions for the Mets en route to their World Series title, which came in improbable fashion after the Bill Buckner debacle for the Red Sox in Game Six. Love them or (as most MLB teams did) hate them, the ’86 Mets will always hold a place in fans’ hearts as one of the most rough-and-tumble teams baseball has ever seen. 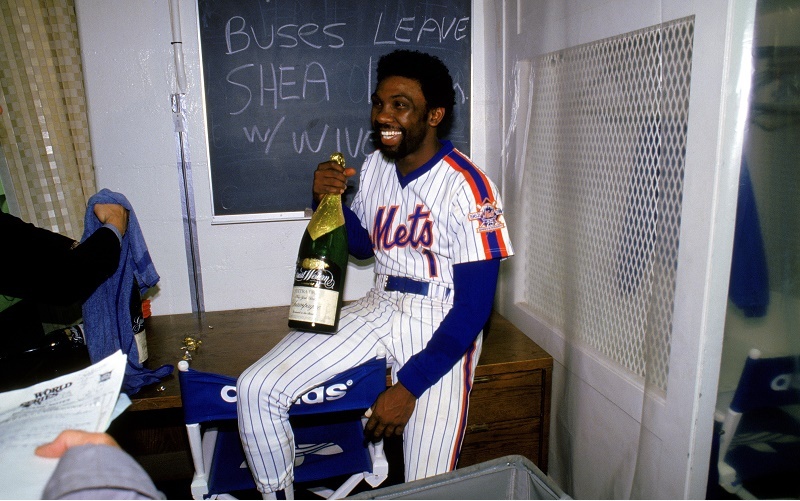 Stints in rehab and jail would be forthcoming for several Mets playing that season, but for a while the club somehow held it together and won the last title Flushing has celebrated.